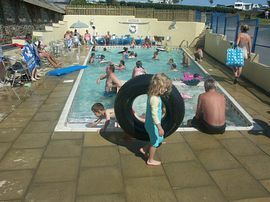 Set in 55 acres of rolling countryside well away from the road and with stunning views of Looe Island and the sea beyond Tregoad Park offers the ideal location for both fun filled family holidays and quiet relaxing out of season breaks. Close to the pretty fishing town of Looe and beaches we can guarantee you a beautiful location, all the facilities and a very warm and friendly welcome. We have a range of accommodation to suit your requirements including a plentiful array of terraced, flat and level grass touring pitches all with electric hookup and static holiday homes. New for 2009 is our camping barn where you can rent a bed for the night or a whole self contained dormitory for up to 8 people. The park benefits from newly refurbished toilet and shower facilities and has achieved a 4 star rating. 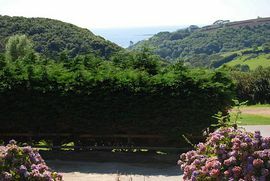 Superb Views to Looe Island and the sea beyond. Take the A38 to Plymouth. At Plymouth follow the signs for Liskeard. Follow the A38 for approx 10 miles through the villages of Landrake and Tideford to the Trerulefoot roundabout. Take the first left at the roundabout onto the A374 signposted to the historic towns of Looe Polperro. Follow this road for about 1.5 miles then take the first right, signposted to Hessenford and Looe, onto the A387. Continue through Hessenford and past Widegates. At Widegates the road bears to the left and changes to the B3253, From Widegates continue for approx. 1.5 miles through Nomansland. The road bears to the right and goes down a hill, the entrance to Tregoad Park is at the bottom of the hill on the left hand side. From East Looe follow the B3253 and signs to St Martins and Hessenford. Stay on this road until it goes down a steep hill. Tregoad Park can be found at the bottom of this hill on the right hand side. 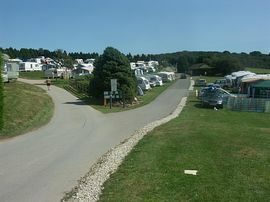 Electric Touring Pitches: £17.00 - £30.00 per night. Tent Pitches: £9.00 - £28.00. Static Holiday Homes: £132.00 - £590.00. All Year siting on Electric Pitch: £1,800.00. Camping Barn from £9.00 per night. Tregoad Park is open all year.